OK, we understand that the 5 Series Gran Turismo was very practical and comfortable, but it was not very elegant, was it? This is why we welcome the G32 generation of the 6 Series which is designed to replace it. Aside from the stylistic advancement, the G32 also features mechanical upgrades that give us three diesel engines and two petrol ones. Our 2.0 BMW 6 Series G32 630i tuning actually makes the I6 3.0 640i obsolete. How is this possible, you might ask? 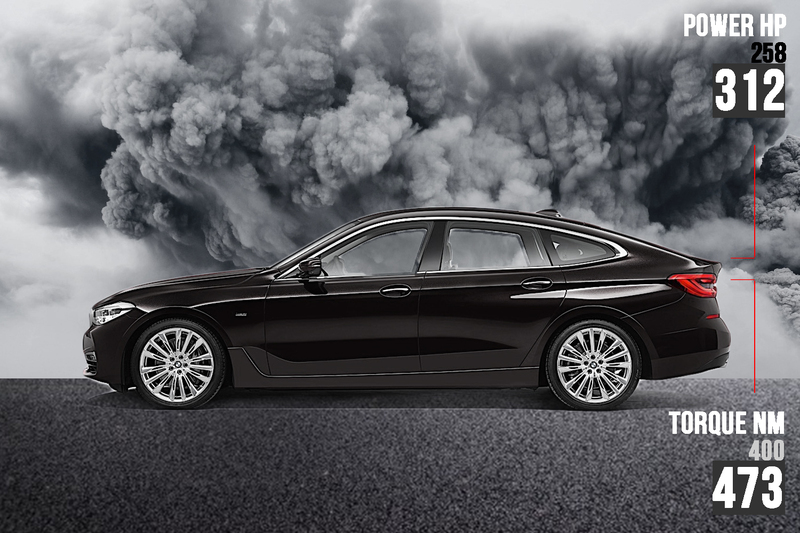 The 630i is powered by a 2 l I4 B48 B20 engine with 255 hp and 400 Nm of torque, while the 640i has a noticeably more powerful I6 3 l B58 B30 engine with 335 hp and 450 nm of torque. As you can see, the stock power figures differ significantly. However, after our G32 630i tuning, the lighter I4 engine pushes the mighty 6 Series as fast as the 3 l engine. And yes, it is completely safe for your car and its engine, as well as all other parts. The safety comes from our extensive testing and data logging, as well as decades of experience and thorough knowledge of the stress levels that even the smallest part in the car can withstand. You get a completely safe and reliable car, but one that is far faster than the stock 630i. It is important to note that this is only Stage 1 tuning that we performed on this particular car. It includes a software remap done on the OEM ECU and only stock parts. We are pleased to report that this engine can be further tuned for even more power with the replacement of some parts, mostly related to the intake and exhaust. So, how did we make the I4 as fast as the I6 using only stock parts? Read on to find out! As previously said, our Stage 1 remap for the 630i includes only a software change with no aftermarket parts necessary. All the improvements come from OEM ECU Bosch MG1CS003 tuning performed by our top engineers after loads of testing and data logging. Aside from the SuperFlow dyno, we also use top-quality car tuning tools which help us perform precise and reliable modifications and fine tune each aspect of the engine operation. This is why we can produce such a noticeable power increase without diminishing the safety or reliability of the car. 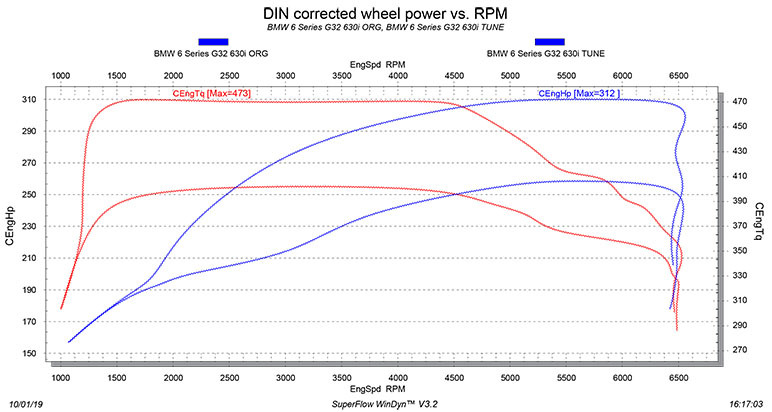 For this particular 6 Series G32 630i tuning, we first adjusted the turbo pressure. Doing this increases the amount of oxygen in the cylinders which, in combination with fuel and spark, creates combustion that propels the car. However, the amounts of fuel and air need to be at an optimal ratio. This means that the increase in the turbo pressure that feeds more air into the engine also requires more fuel. This ratio needs to be carefully measured to ensure combustion is as efficient as possible. This fuel delivery change is also done via a software modification. The added fuel and air result in more power and torque. However, the tuning process is not completed. After these modifications, we also need to change ignition timing. It does not do much to increase the power rating, but it is very important for good combustion and vastly improved driving feel. Ignition timing is advanced, which results in a much faster reaction time when you press the pedal. The throttle response is almost instant and even without the added power it would make a lot of difference in the way the car drives. Add to that the new power and torque gains and our G32 630i tuning turns this stylish BMW into a whole new car. So, how much power does it actually have after tuning? The measured output sits at 312 hp and 473 Nm of torque from that same I4 B48 engine. The power gain is completely safe, so you can relax and enjoy the extra power. This model is the entry level petrol version, but after our tuning it has just a bit less power, more torque, better fuel efficiency and far better throttle response than the I6 640i. Add to that the fact that the 630i is 50 kg lighter than the 640i and the smaller engine suddenly becomes far more appealing. That is until we tune the I6. But that is a whole different story. The I4 B48 is actually a very popular engine. It appeared in 2014 and it powers almost any BMW model with a four-pot engine, such as the latest versions of the 3 Series, including the F30 330e, F20 1 Series, G30 5 Series, G01 X3, F22 2 Series, F48 X1, F39 X2, G29 Z4, G11 7 Series, as well as some models from other manufacturers like the all-new Toyota Supra A90/J29 or several Mini models. We can tune any of them with similarly remarkable results.